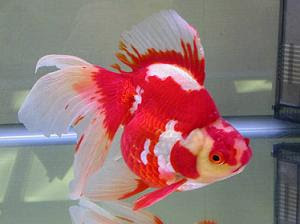 Ryukin is a beautiful variety of the goldfish. It can easily be identified from other types of goldfish by its deep body and with a hump right before the head near the dorsal fin. It has long finnages similar like veiltails and it is commonly found in red, white and orange color. Ryukin has metallic scales and the tail fin is fully forked and divided. 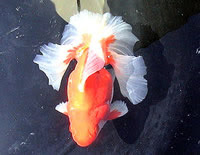 It is considered a hardy fish, which can grow up to 8 inches long and is very popular in Japan. There is another Japanese variety of the Ryukin called the Tosakin that has similar characteristics except that the tail fin opens flat and wide horizontally. If you observe the fish from above, the tail actually spreads out nicely like a butterfly and the beauty is indeed magnificent. However, Tosakin is rather delicate and is very difficult to breed. It swims clumsily and generally requires extra care such as making sure the stream of water is not too turbulent or else it will jeopardize normal tail fin development. And because of its slow swimming nature, some aquarist has resorted to use hand spawning in order to successfully breed the goldfish. Tosakin is also very sensitive to changes in water quality and some experts actually suggest using slight greenish water containing algae. In order to produce the desired butterfly tail, some aquarist has gone to the extreme by keeping the fish in a small container to limit the growth and length of the body while allowing the tail fin to develop. In Japan, Tosakin is highly prized and sought after and various competitions are organized to select the best fish. Related posts: Find out about preparing and treating aquarium water for fish and performing control adjustment using aquarium pH test kit.